This actually made two servings. There was sweetness from the fruit, tartness from the lemon and the heat of ginger and blending together for a tasty and easy dinner. About 20 minutes from start to finish. Who doesn’t love a grilled sandwich? I discovered that pears are delicious on a grilled rye sandwich. I don’t have a grill nor a yard for grilling, but if you turn your stove fan on high and pay attention you can grill thinly sliced pears on the electric burner. Just don’t try to do more than three slices at a time. 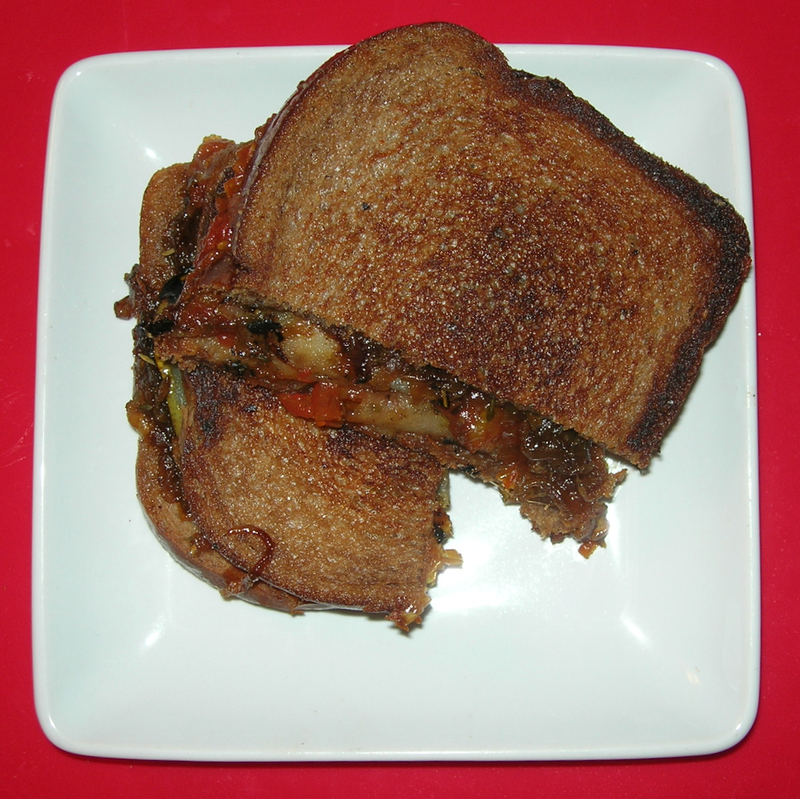 To make this sandwich, I heated my griddle to medium heat and buttered two slices of rye bread. I spread some caramelized onion jam on one side and some tomato jerk jam on the other. I layered 1/2 of a pear thinly sliced and grilled on top of both slices of bread and let them cook on the griddle until toasted, putting the sandwich together after it’s done. The char on the pear gives it such a delicious flavor, sort of sweet and smoky. The onion jam is deep and herbaceous with the flavor of bay and thyme lifted by balsamic vinegar. The tomato jerk jam is bright, sweet and earthy. Together they all come together into a burst of flavor that is bright, fresh, and satisfying. If you spread the rye bread with olive oil instead of butter, you could make a vegan version. Leave 3 eggs out overnight so they are room temperature when you make this. Heat cast iron skillet on stove top. Add 3 TBSP of butter and melt until bubbling, but not browning. Meanwhile, beat 3 eggs (room temperature) for about a minute, just to get some air in them. Add 3/4 cups of milk. Add 1/2 tsp of salt. Mix together and pour into the melted, bubbling butter. Put in the oven and bake for 15 minutes, turn the oven off and let sit for another 5 minutes. While it’s baking, melt a TBSP of butter, peel and dice one pear, add to the butter and cook until tender. Add 1 TBSP of brown sugar and let it melt into the butter, coating the pears. 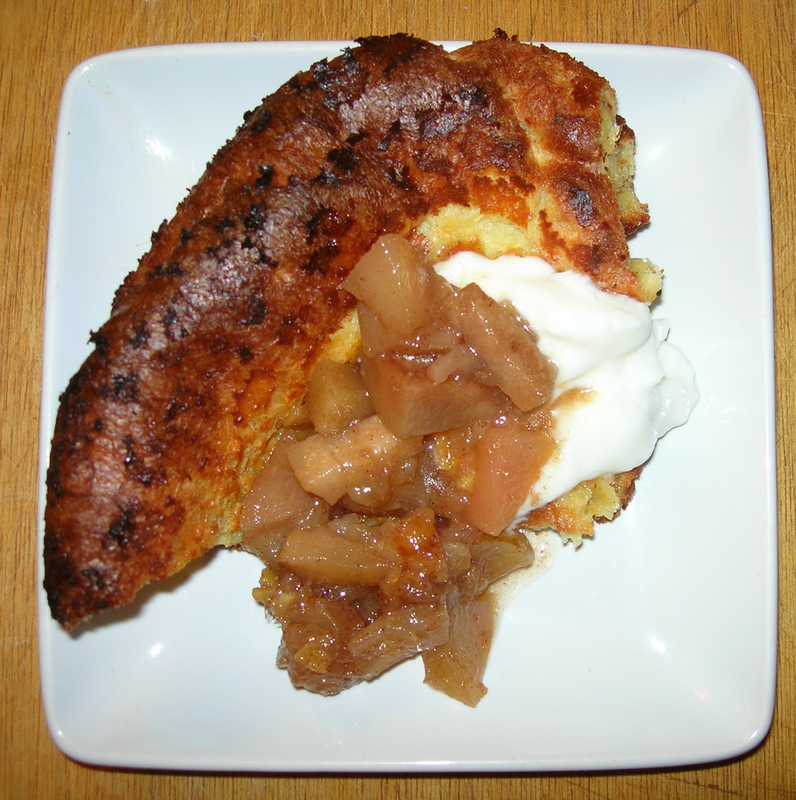 Cut your Dutch Baby into quarters, put a fourth of your pear sauce on top, with a spoonful of plain yogurt. This is simply delicious, fast and easy. It’s a recipe that is easy to keep in your head, too. Think of the 3s, 3 eggs, 3/4 cups of flour and milk, 3 TBSP of butter. 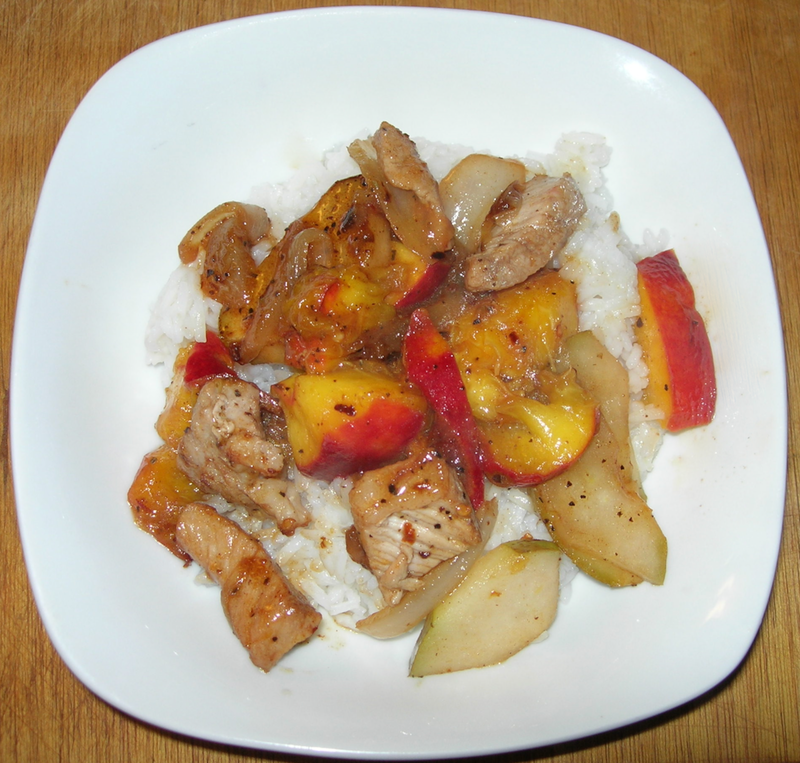 It’s also not too sweet, the yogurt adds a nice tang that balances any sweetness from the sauce. This is so delicious that I am going to make it again and again, though it would be nice to add some fresh parsley just to get a bit of green. We humans like a bit more color variety in our food, but the flavor is intensely varied. I was at Harvest Share and a woman from Somali who was in line ahead of me asked what she might make with turnips. I mentioned how much I like them in a salad with pineapple and onions, but we also were given a big bag of pears and I said the pears and turnips would go together in a soup or puree. When I got home, I was inspired by our conversation to come up with something tasty with turnips and pears. I had a chicken breast thawed out for supper, so I decided to try something with chicken. I thought the piquant flavor of the turnip would go well with ginger, so I decided to focus on ginger and garlic for flavor. Wow, it worked out so well. I heated a cast iron skillet to medium heat with about 1 TBSP of olive oil. I chopped up ¼ yellow onion, 2 garlic cloves, and about ½ inch of ginger root chopped fine and added to the skillet with some salt and pepper. As soon as the onions softened, I added the chicken breast. I might have cooked a whole breast, but I bought this bargain bag of chicken breast pieces, so I cut it up into bite-size pieces. While the chicken browned, I peeled a turnip and cut into ½ inch size pieces. It was more than I wanted, so reserved half for something tomorrow and added half the turnip pieces to the skillet. I stirred things around and put the cover on for about 8 minutes, to the point where the turnip was close to tender. Meanwhile, I peeled a mid-size pear and chopped into ½ size pieces. When the turnip was close to done, I added the pears and stirred, sauteeing for about 2 minutes since the pears just need to be warmed. I removed the food to a plate and added about 1 TBSP of water to deglaze the skillet. Stirring the juices in, I added a teaspoon of balsamic vinegar and added the food back, stirring it into the sauce, making sure it is well-coated. I served it on a plate and sprinkled some sliced almonds on top. This is so delicious, there is this wonderful umami from the chicken and onions, this fresh tartness from the ginger and turnips, and a delicate sweetness from the pears. It comes together in this rich flavor explosion. I think I might toast the almonds next time. It might be interesting to try with pistachios, too. A sprinkling of fresh parsley would add some color. Put 3 TBSP of olive oil in the bottom of a large stock pot on a medium low burner. Add 1 TBSP of cinnamon, 1 tsp of allspice, salt, pepper and heat until the aroma rises. Add 2 TBSP of chopped ginger, and I know that is a lot, but ginger is what we need to make this a savory soup, not a dessert soup. Ginger and onions, which come next. Add 1 yellow onion, chopped coarsely. It’s all going to be pureed in the end, so don’t bother chopping fine. Sauté until onions are soft and transparent. Peel 8 small yams and cut into uniformly sized chunks, about 2 inches square. Toss into the pot with 32 oz. of vegetable broth. Bring to a boil, then reduce to simmer. Cook until tender, about 20 – 30 minutes depending on the size of your chunks. Test with a fork. Peel 4 pears, remove the stem, and chop into pieces and add to the pot. Cook for 15 more minutes. Add 32 oz. of unsweetened coconut beverage. Let cool and puree using a Magic Bullet, blender, or immersion blender. I used 5 slices of fresh pear (one sunk) and a couple baby spinach leaves to garnish. I was going for the artistically pleasing Rule of Five, but one did not cooperate. I suppose if I were a super arty food blogger, I would make another bowl, but that seems silly for this blog. This makes a smooth soup that is about the consistency of a canned tomato soup, but the similarities end there. It is so good, it is not the least bit sweet, but tastes of yam and pear and these deep aromatic spices with a little bit of heat that lingers from the ginger. It is not the least bit sweet despite the pears. The ginger and allspice are important in grounding the flavor on the savory side. If you don’t have allspice, you could use nutmeg or cardamom. It’s also kind of addictive and from spoon-licking from when I served it up to reheat, I can tell you, it’s actually pretty good cold, too. It was tasty last night, but today’s its flavor is richer. This is no single-serving. It makes 4 quarts of soup, which was nice to send some home with friends and to save for lunches this week. The unsweetened coconut beverage is in a white unlabelled box with the ingredients stamped on it for Oregon Food Bank. This product from Pacific Foods matches the ingredients in type and order of quantity. Everything but the olive oil and spices came from the Oregon Food Bank’s Harvest Share program. Harvest Share is a program that provides fresh produce to low-income Portlanders through the Oregon Food Bank. This is a big contrast with regular food bank products which are dependent on donations and tend to focus on nonperishable carbs like rice, pasta, beans, bread, and crackers. It’s a fabulous program that I wish were available across the country because fresh produce is expensive and many food banks simply do not get enough donated, and what is donated is often well past its prime. I don’t know what got into me today, but I was about to make a roast pork and slaw sandwich and I thought about all the pears I need to eat and ended up making the most delicious sandwich ever. 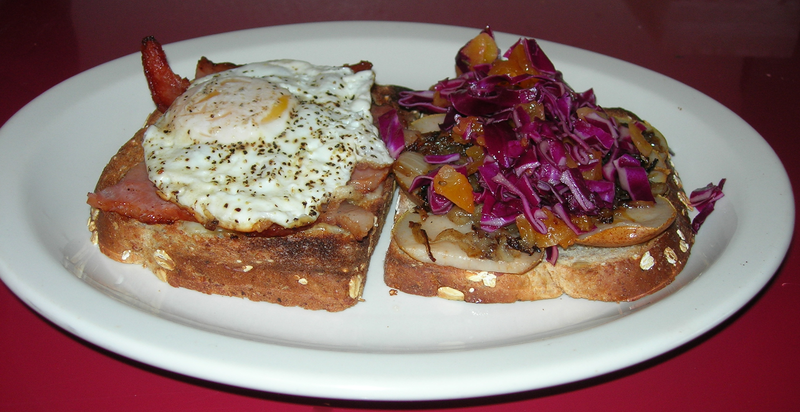 It began with the Apricot Cabbage Slaw I was going to make for the sandwich. I got ambitious and decided to make slow caramelized onions. To do that, I thinly sliced 1/2 an onion on a mandoline. I heated a cast iron skillet to medium high (7 of 10), added 1 TBSP of saved bacon drippings (but you could use olive oil or butter) and melted it. I added the onions and cooked quickly, stirring frequently for about 5 minutes until browned, then I lowered the heat to medium-low (3 of 10) and let cook slowly while I prepared the Apricot Cabbage Slaw. Be patient, the longer the onions cook, the more tender sweet they are, almost like a jam. Turn the broiler on before the onions are done to heat up. When the onions were done, I removed them and set them in a small bowl. 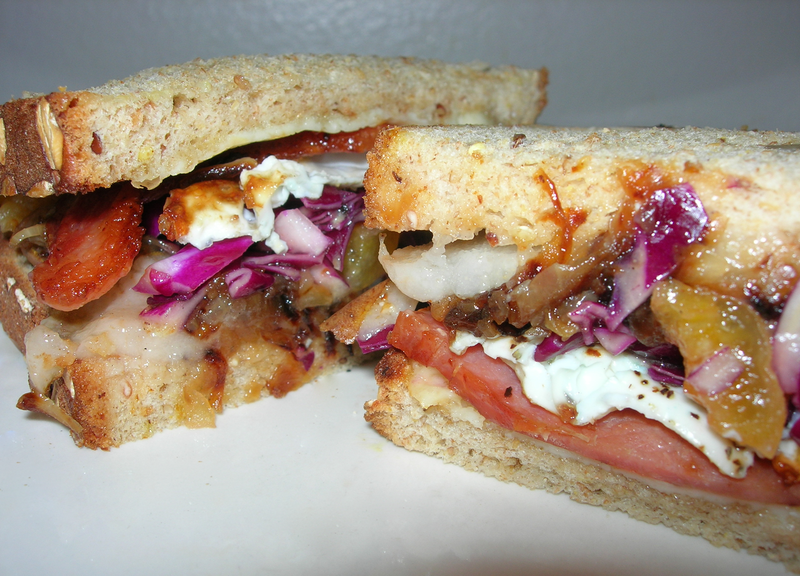 Any leftover onions can be used in a sauce or another sandwich. I then cooked two slices of bacon in the same pan, rendering the fat and saving it for another day. I removed the bacon and set it aside. While the bacon was cooking I broiled 2 slices of bread on one side for about 2 to 3 minutes. Just to get some strength from drying, it did not get toasted. Between broiling on one side and then on the other, it was time to cook the egg. I wiped the fry pan clean of any bacon, and put a dab of butter in the middle of medium hot pan and cooked one sunnyside up egg, adding some salt and pepper. While the egg was cooking, I broiled the other side of the bread. On one piece, I shaved parmesan cheese. 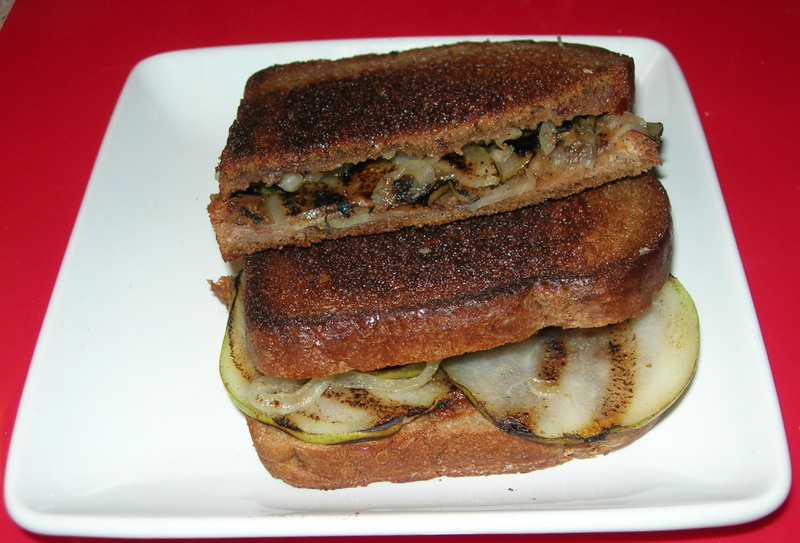 On the other piece, I layered thin slices of pear to caramelize sightly. I put them back under the broiler for a few more minutes until the parm was melted. On the side with the melted part, I stack the two slices of bacon, cut into 4 pieces. I added the sunny side up egg. On the side with the pears, I stacked caramelized onions, and the Apricot Cabbage Slaw. Then I put the two pieces together with a bit of hard push to break the egg yolk so it spread through the sandwich and sliced it in half. Believe me, this is worth spending 40 minutes to make. 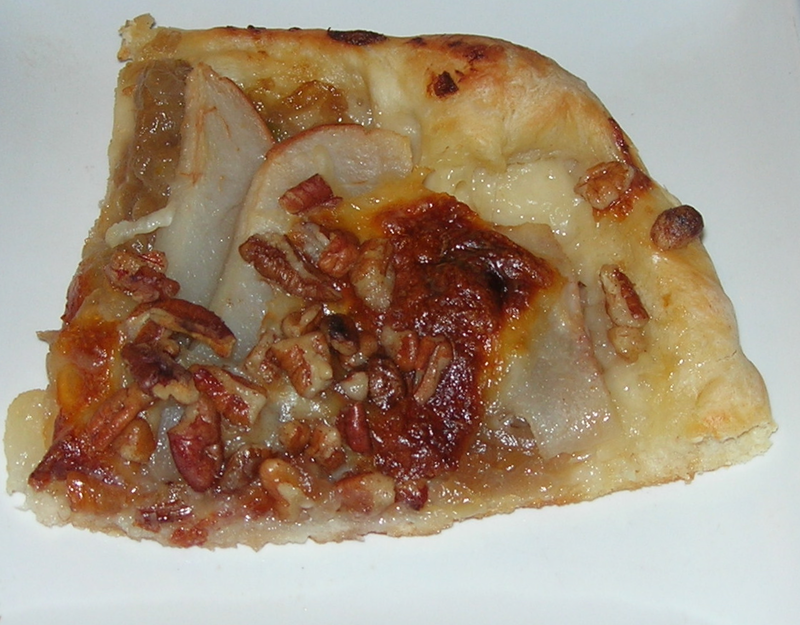 The pear and caramelized onions are dream. And of course, bacon, eggs, and parmesan are delicious. A good sweet/sour slaw is a perfect balance to the sweetness and the creamy egg marries everything together. This is the most delicious sandwich I have ever concocted. This made one sandwich, but I have some caramelized onions and slaw left over. 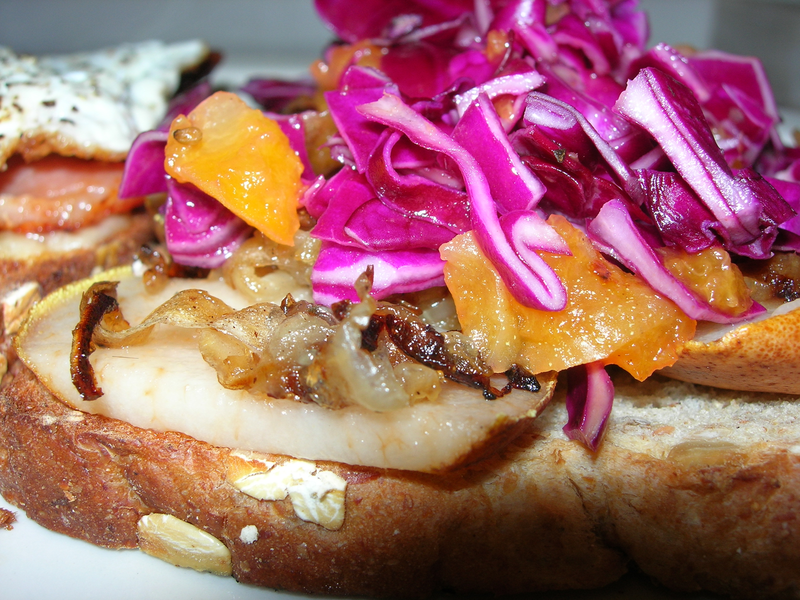 I had thought to make a vinaigrette with the onions, but now I think I will be making this sandwich for supper. 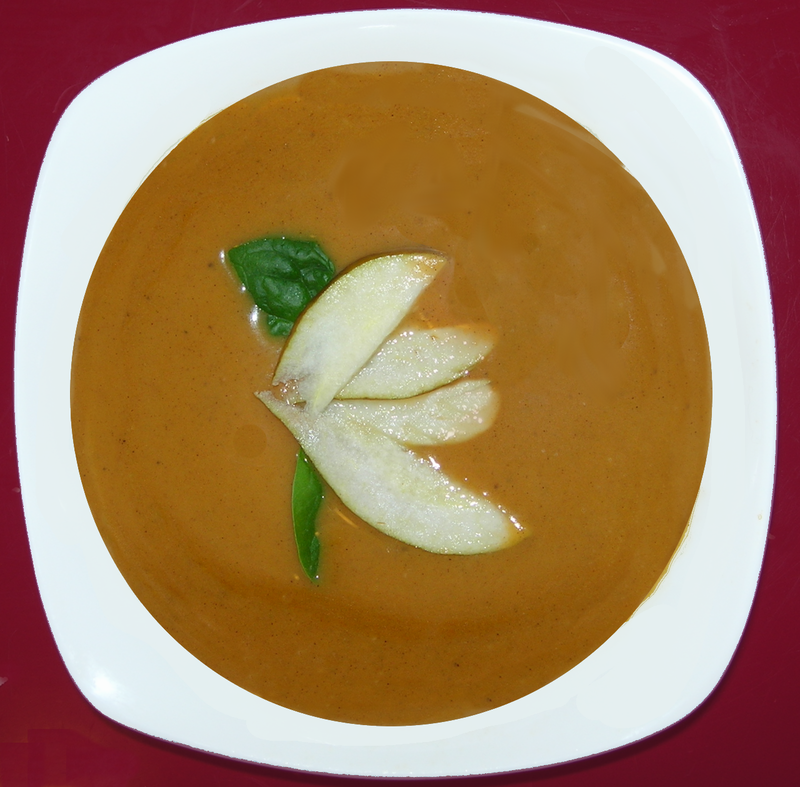 I have an abundance of pears so I decided on making a pear soup. 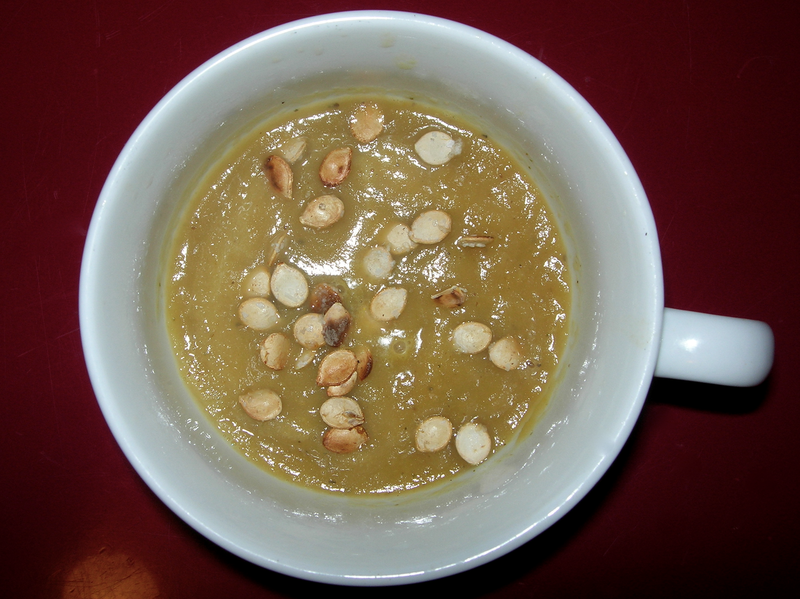 One of my favorite soups is Pear & Parsnip Soup but I didn’t have any parsnips. I had a delicata squash though and thought it looked promising. I put my soup kettle on a low medium with the olive oil. I added the diced onions and dried thyme, letting them slowly cook until transparent. Meanwhile, I peeled and chopped up the squash, reserving the seeds. It made about 2 cups of chopped up squash, perhaps a little bit over. Adding the squash to the pot, I stirred and let cook for 3 to 5 minutes. While they cooked, I peeled and chopped up the pears and added them to the pot and let it cook a couple more minutes before tossing in the wine and the broth. I turned up the heat so it began to simmer and let cook for about 20 minutes. While the soup was cooking, I rinsed the seeds in water and cleaned away the stringy pulp. Pushing the pulp against the strainer mesh helped in cleaning it away. I then heated a cast iron skillet in a dry pan with no oil to a notch above medium. I tossed the seeds in and toasted them with some kosher salt until toasty brown, stirring frequently so they did not burn. These I set aside for garnish. I let the soup cook until the squash was tender and puréed with an immersion blender. Serving with a few squash seeds on top, it was a delicious soup. The flavor of the wine comes through without overpowering the soup. The sweetness of the pears and the squash make it lush and slightly sweet. It is a light and refreshing soup. This makes six servings. This was the fruit and cheese course in the six course Christmas dinner yesterday, a collaboration between my best friend and me. We had a lot of pears so it made sense to use them. I remembered this extraordinary Brie she had at Thanksgiving which I thought would make a great accompaniment. Googling for pear and brie recipes brought up lots of for a tart of crostini. With everything else, it made sense to go for something lighter, with less bread, a naan or pita, perhaps. Then I remembered a recipe in the fabulous Soframiz cookbook I reviewed earlier this year for Yufka, a flatbread that is a tiny bit richer than pita, light and delicate, but not a pastry. It really worked perfectly. Mix the salt and flour in a bowl, make a well and add the water and olive oil. Mix with your fingers until well blended. Then knead for a good three minutes. I counted to 180 kneading. Lightly brush with olive oil, wrap in plastic wrap and let rest 4 hours or more. I let it rest overnight. When you’re ready to cook, divide into 2 oz portions. I used a scale. I expected it to come out to 6 pieces, but it came out to 7. Bonus! Roll it out as thin as you can, use plenty of flour to keep it from sticking. It should be thinner than a tortilla and about 8 inches round. Heat a skillet or griddle to medium high. Do not grease. Cook on one side until it bubbles, then flip and cook on the other. About 2 minutes each side. These are partially cooked yufka that finish cooking whenever you do what you do with them. Preheat oven to 400°. Slice three pears and 12 oz of brie. Lay the yufka on a baking sheet, lay down the layer of pears, add the brie, drizzle with a bit of olive oil and sprinkle dried thyme over it. Put it in the oven to bake, just until the cheese browns very lightly. Meanwhile, toast a cup of chopped hazelnuts in a dry pan. 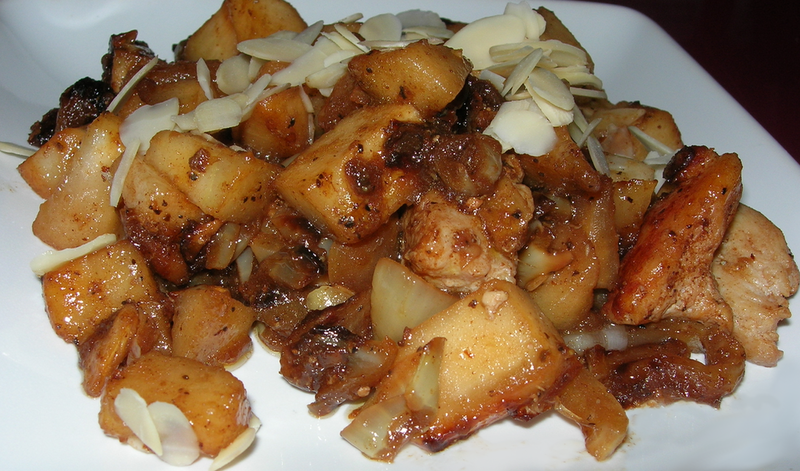 Place each yufka on a plate, sprinkle with the hazelnuts and serve warm. This was so delicious, rich and flavorful without being overly rich. Makes 6.